Back down the winding track through the old woodland, the rainfall rivers across the way have now dried, as has the protection site. While last week, the river was threatening to break its banks, this week it has a mellow calmness about its movement and it has dropped well below the field level. High up in the tree now sits a complete clutch of three precious speckled eggs. It’s not all peace and quiet though – there’s a fair bit if mutual antagonism between the ospreys and their carrion crow neighbours with the ospreys giving chase or being mobbed over the course of each day. On Saturday I retuned to the Glaslyn osprey protection site near Porthmadog in North Wales for another eight hour shift. This time I had company in the form of Jack, one of my fellow volunteers from my local conservation volunteering group. To break up the shift, Jack and I took it in turns to go for a walk in the woodland near to the site. It’s a lovely spot in amongst the old moss-covered oaks and the small craggy hills. Spring bird song was all around and no road noise to disturb the peace; in fact it was almost silent when we arrived at the site. The bluebells are starting to come through, a little later than at home, and the trees are just starting to burst their leaf buds. It’s not just the ospreys that keep our interest while on shift; the valley is full of life. The birds are the most obvious with 38 different species seen or heard by me on my three visits so far this year but there are mammals too. The bank voles scuttle on the drystone wall beside the caravan and often a weasel isn’t far behind. There are badgers in the vicinity of the protection site and a lucky few get a glimpse of otters in the river – but not me so far! In my 30-odd shifts over this and the previous two springs, I have never had an incident to deal with but this changed on Saturday. Part way into the shift, a cyclist came through the gate by the caravan and proceeded past and towards the bridge over the river. I spoke to him and made him aware that while the footpath wasn’t closed, there were nesting ospreys in the area and that if he continued across the bridge and into the field he risked disturbing them. I told him that if he did indeed disturb them, he would be breaking the law (Wildlife & Countryside Act 1981) and if this was a serious disturbance I would call the Police. This didn’t seem to bother him and he dismissed my warning with some mutterings about cycling on footpaths and off he went. He said he would push his bike around the edge of the field but got back on to his bike and rode straight across once over the river. When he approached the vicinity of the nest tree, the female flew off, circled above and then appeared to dive towards him before they both disappeared from sight. However, the male stayed firmly on the nest, keeping the eggs warm and the female soon returned. No harm was done in the end but it just shows how little care some people have for wildlife when their presence risks inconveniencing them. 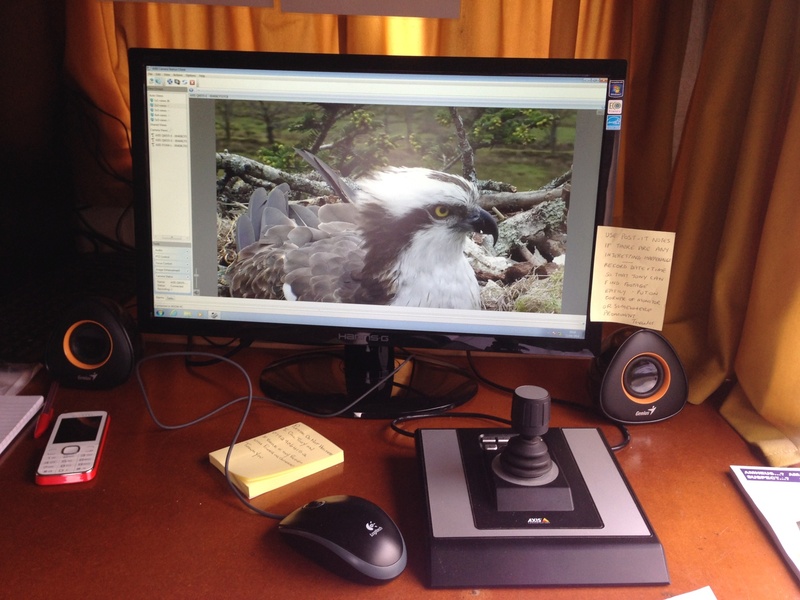 This entry was posted in Conservation and Environment, Conservation Volunteering, Cycling and tagged Glaslyn, osprey, Wildlife ad Countryside Act 1981 by daftmumblings. Bookmark the permalink.